There isn't enough room in a single post for all of the contempt and ridicule NBC's latest hiring move deserves. 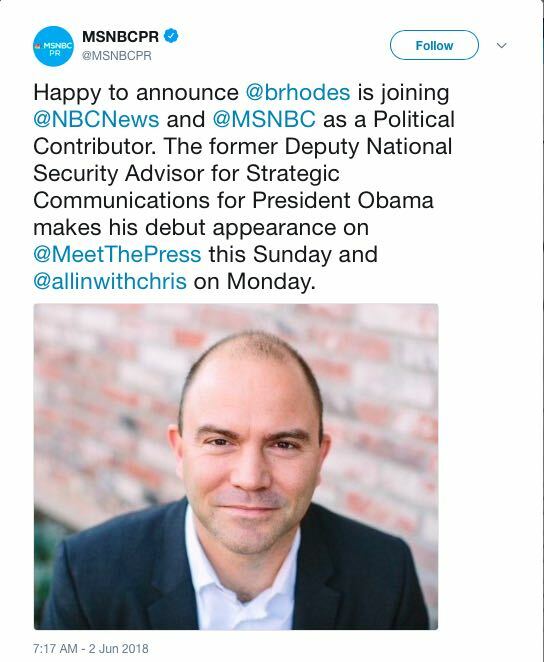 The PR department at its MSNBC cable outlet waited until early Saturday morning to tweet its announcement that Ben Rhodes, the Obama administration's Deputy National Strategic Advisor for Strategic Communications, would be joining both NBC and MSNBC as a "Political Contributor." Who knew that systematically misleading and ridiculing the press while in office in the name of selling the fatally flawed Iran nuclear "deal" would be a resumé enhancer? What Rhodes admitted to David Samuels in a New York Times Magazine interview in May 2016 should have disqualified him from future participation in journalism. He took heat in 2016 when he boasted in a New York Times profile of creating an "echo chamber" to sell the Iran nuclear deal and mocked Washington, D.C., reporters. 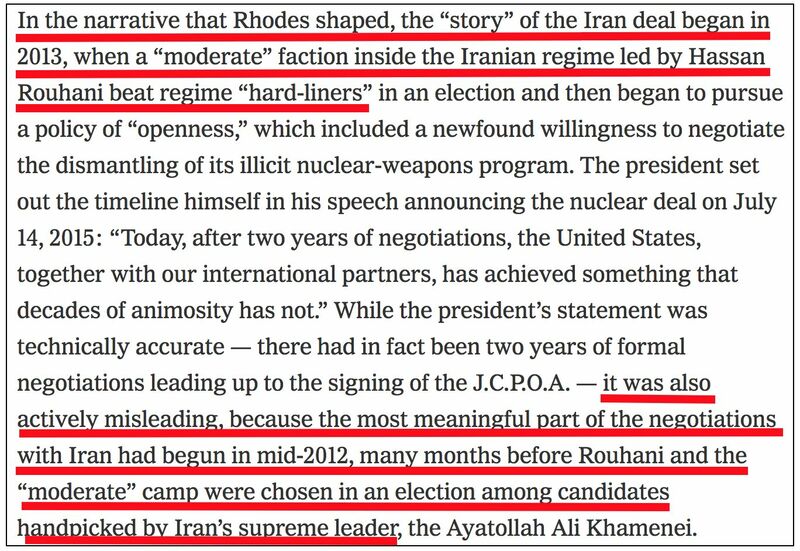 First commenting on the red-underlined verbiage, Rhodes and the Obama administration knew that Rouhani was no moderate, and that the Iranian regime's rabidly anti-Western jihadist posture hadn't changed a bit (and still hasn't). They knowingly lied to the press about this. The Associated Press also helped the Obama administration complete the mid-2012 "most meaningful part of the negotiations" by keeping them secret. In November 2013, the AP's Julie Pace gleefully told the nation on Fox News Sunday that it knew about these negotiations as early as March 2013, but didn't report them. After my related NewsBusters post criticized Pace and AP for sitting on the story, the wire service's management claimed that it didn't report the negotiations because it lacked sufficient confirmation. That was horse manure. 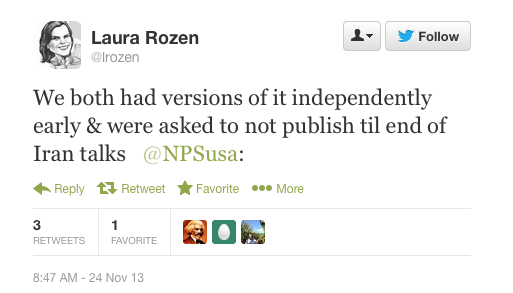 The Obama administration asked AP not to disclose the negotiations, and AP complied with that request. We only know that because another reporter at another news outlet which became aware of the negotiations admitted that "We both had versions of it independently early & were asked to not publish til end of Iran talks." As to the green-underlined items, we'll have to leave it NBC how it can defend hiring someone who has "brutal contempt" for so many journalists both there and elsewhere. There's obviously no need for a transcript. Past NewsBusters posts, an Obama-era compilation at the Media Research Center, and a 2011 Investor's Business Daily editorial highlighting the MRC's prior related work show that there is a long, incestuous history of former Democratic administration officials moving into prime perches at left-leaning news outlets, and vice-versa.